``You're famous, Sweetheart,'' said Teddy. ``Whatever do you truly mean, Teddy?'' asked Sweetheart. ``Ponyart.com has artwork that features you and your friends as your overweight selves. Not only that but you all are so popular there are toys that got released,'' explained Teddy before winding up a Plump Pony Sweetheart wind-up toy and watching it go. ``Well whomever this person or pony is, they aren't all that bad at drawing. Says that these pics are to be more attractive versions of us and I can attest to that,'' said Starlight looking at the artwork. ``Wow, Rainbow Dash, you look really enticing,'' said Pinkie Pie. ``Yes I have been working on that side of me as of late, dahling. It's where my rainbows are besides my hair,'' replied Rainbow Dash. ``Oookay. So what ponies have been done here?'' asked Twilight slightly puzzled. ``So far, the user put up one of Rainbow Dash, your version of Rarity and your version of Pinkie Pie,'' replied Bright Eyes to Twilight. ``I......see,'' stated Twilight, unsure of what to make of all this. ``Whomever this is, they captured my flank very well,'' remarked (Rarity). ``Sure as heck hope I don't get one of them overly attractive drawin' line arts,'' added Applejack. ``Look, the user has other artwork of us,'' pointed Melody. ``The art is the very brightest,'' said Sunny-Daze. ``The overall plumpness is done very well,'' stated Bon Bon. ``Can you just imagine if the user came here?'' asked Melody. ``Have you guys seen these giant plush dolls of you? Their bellies are filled with liquid so they jiggle like yours do,'' said Ace. ``They're expensive though, about 300 jangles,'' warned Lancer. ``What the hay are them jangles?'' asked Apple Bloom. ``It's what we use for money,'' explained Bright Eyes. ``Would y'all accept our currency of Bits?'' asked Applejack. ``I guess so,'' shrugged Starlight. ``Forget the teddy bear, I'm getting one of those plushies of Sweetheart,'' announced Teddy. ``I don't know if they even have one but I know a Melody one exists,'' said Lancer. ``Even I have some artwork,'' pointed Star Swirl. ``That shirt you have on in that art reminds me of the one Wobbly has when you try to find him in books,'' giggled Minty. ``That Wobbly is a tricky one. I wonder if anyone has ever found him,'' pondered Melody. ``I guess that's why they title the books `Wobbly Went Where?''' figured Bright Eyes. ``Why do they call him Wobbly?'' asked Twilight. ``He's a pony in his late 70s and needs a cane or he wobbles back and forth,'' replied Lancer. ``We all have something that wobbles back and forth if you know what I mean,'' winked Pinkie Pie. ``You can say that again and it's good to have,'' agreed Bon Bon. ``Well except when you end up running into one another,'' protested Clover. ``Even for then, Clover, it's not so bad because instead of hitting muscle and bone, you're hitting a soft layer of fat,'' protested Bright Eyes. ``It's good to see more than just your waistlines growing around here. It shows that there's fans out there willing to spread the love,'' said Eduardo. ``As long as we have fans, we're willing to stay fat,'' declared Melody. 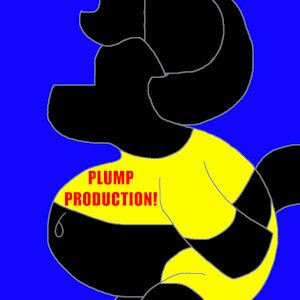 ``I think fans or not, we'll always be plump. After all, it's been our obsession for the past few years and it's helped us gain more than pounds,'' said Bright Eyes. ``We've received more good than bad,'' said Clover. ``That's true, Clover. Now though we won't have to worry about any real dangers thanks to our new security fence,'' replied Starlight. Residents find themselves with positive feedback thanks to an art hosting site and merchandise.